Died 432; feast day formerly celebrated on October 7. 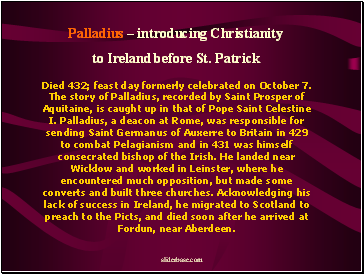 The story of Palladius, recorded by Saint Prosper of Aquitaine, is caught up in that of Pope Saint Celestine I. Palladius, a deacon at Rome, was responsible for sending Saint Germanus of Auxerre to Britain in 429 to combat Pelagianism and in 431 was himself consecrated bishop of the Irish. 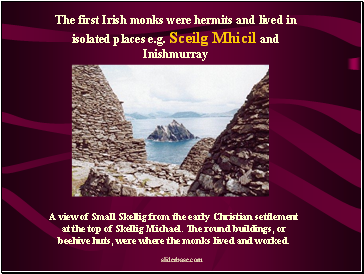 He landed near Wicklow and worked in Leinster, where he encountered much opposition, but made some converts and built three churches. Acknowledging his lack of success in Ireland, he migrated to Scotland to preach to the Picts, and died soon after he arrived at Fordun, near Aberdeen. He had for his parents Calphurnius and Conchessa. The former belonged to a Roman family of high rank and held the office of decurio in Gau or Britain. Conchessa was a near relative of the great patron of Gaul, St. Martin of Tours. 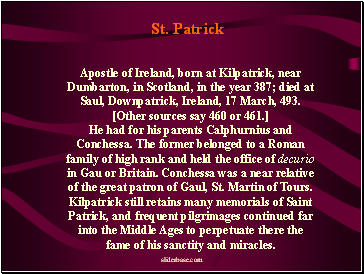 Kilpatrick still retains many memorials of Saint Patrick, and frequent pilgrimages continued far into the Middle Ages to perpetuate there the fame of his sanctity and miracles. 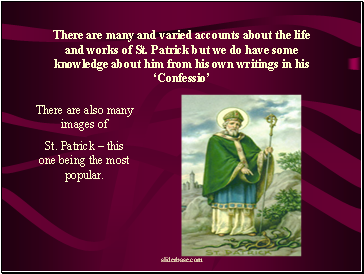 St. Patrick – this one being the most popular. 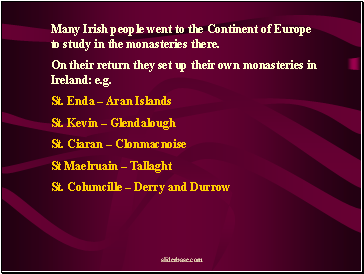 Many Irish people went to the Continent of Europe to study in the monasteries there. 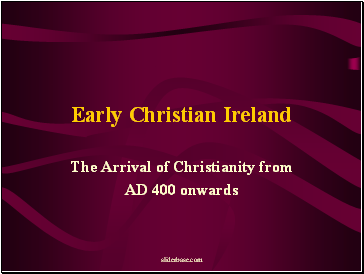 On their return they set up their own monasteries in Ireland: e.g. 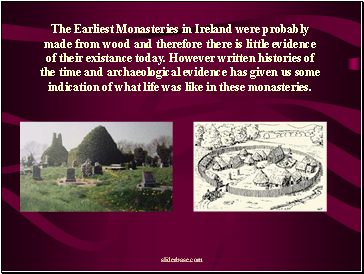 The Earliest Monasteries in Ireland were probably made from wood and therefore there is little evidence of their existance today. However written histories of the time and archaeological evidence has given us some indication of what life was like in these monasteries.